When: Sun., April 28, 6:30-9 p.m. 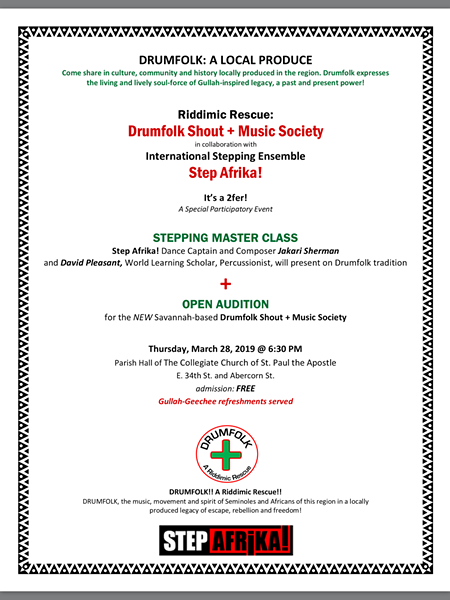 The Riddimic Rescue: Drumfolk Shout + Music Society, in collaboration with international stepping ensemble Step Afrika!, will be holding a special participatory event. It’s a 2fer: a stepping master class will be given by Step Afrika! Dance Captain, composer Jakari Sherman—and David Pleasant, World Learning Scholar, percussionist-composer, will present on Drumfolk tradition—and hold an open audition for the new Savannah-based Drumfolk Shout + Music Society. DRUMFOLK, the music, movement and spirit of Seminoles and Africans of this region in a locally produced legacy of escape, rebellion and freedom! Gullah-Geechee refreshments served.